Aging is a fact of life. However, if a skincare product claims to be able to turn back the hands of time, it's hard not to pay attention. 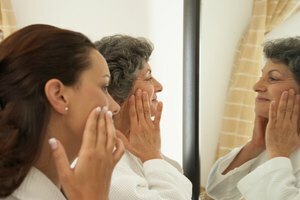 The beauty industry continues to answer the call for new products that can rejuvenate skin by preventing, and sometimes even reducing, wrinkles. Anti-aging facial serums, creams, exfoliants and toners feature ingredients that claim to make skin look and feel younger. Two of the most effective? Retinol and glycolic acid. Retinol is a form of vitamin A that is so small, it's able to penetrate through to the lower levels of skin where collagen and elastin reside. It actually communicates with the cells, encouraging them to function normally and promote regular cell renewal. Retinol is used in a variety of lotions and creams to help reduce the appearance of wrinkles, smooth fine lines and repair sun damage. Retinol serums are formulated with enhanced absorption to penetrate into deeper layers of the skin. This hero ingredient can also help to unclog pores, so it's used in some acne treatments. There are some side effects, though, including a warming sensation, redness, itching and scaling of the skin. For something gentler, try rosehip seed oil, which contains a precursor to vitamin A, as a day or night serum. It may not be as potent as a straight retinol product, but it does have similar effects. Glycolic acid is an alpha hydroxy acid made from the sugar cane plant. It loosens the bonds between dead skin cells, making it easier to remove the top layers of skin, and speeds up the skin renewal process. Used in skin-lightening products, this acid helps to fade dark spots and pigmentation faster. Since it's so powerful at removing dead skin cells, it's also beneficial in acne treatments. Facial creams and lotions that feature glycolic acid help make skin smooth, reduce hyperpigmentation and deep clean the pores. Glycolic acid is also used in body washes, in hair care products to deep clean the scalp, in foot care products to help remove thick skin, and in hand and nail care products to smooth and brighten the cuticles and nails. The down side? Glycolic acid can cause redness, flaking or a burning sensation, especially if you have sensitive skin. In rare cases – usually those involving higher-concentration chemical peels – it may cause inflammation, infection and skin discoloration. For a milder natural alternative, mix organic cane sugar with raw honey. Use it as a scrub or an overnight mask. Both glycolic acid and retinol are potent anti-aging ingredients. However, both can increase skin sensitivity to sunlight. Always wear sunscreen and protect your skin from exposure while using these products. Sensitive skin is more susceptible to the side effects. Always test a new product on a small patch of skin before going all in. US National Library of Medicine National Institutes of Health: Journal of Drugs in Dermatology: One-year topical stabilized retinol treatment improves photodamaged skin in a double-blind, vehicle-controlled trial.